With the new track construction tents made by Trotec with the indicator "R" for "rail" Trotec offers exactly for the need of welders and railway workers: safe working tents made of refractory material and with innovative mounting directly on the rails. The track construction tent protects not only against rain it also protects against cold and wind. 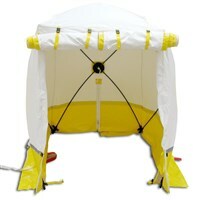 This tent can be attached in seconds by one person so. The tent is screwed onto the rail and secured with mooring ropes, so it can not be blow away from passing trains.